Digi-Schlock: FROM BEYOND (Scream Factory Blu-Ray/DVD Combo Pack) – Schlockmania! From Beyond was a latecomer to the digital video scene. It had to wait until 2007 to enter the fray, courtesy of an excellent disc from MGM that restored the film to its director’s cut and threw in a fistful of extras to further enhance its value. The results looked good enough to make horror fans hope that it might one day get a blu-ray upgrade. That day has arrived thanks to Scream Factory via this new blu-ray/DVD combo pack – and their new high-def special edition delivers both a strong image and an array of new bonus features. The anamorphic transfer does well by a challenging title. Mac Ahlberg’s cinematography relies on vivid lighting, including particularly intense hues of blue and pink, and that neon-tinged color scheme really packs a punch here. The bright colors are balanced with an appropriately crisp level of detail, ensuring the transfer boasts a consistently strong image quality from start to finish (even the workprint bits added in blend well with the rest of the negative-derived presentation). Lossless 2.0 and 5.1 stereo tracks are included on the audio side of things. The latter option was used for this review and it makes nice multi-channel use of Richard Band’s shivery score and creepy sound effects during the experiment scenes. Those who missed out on the MGM DVD will be happy to know that this new blu-ray retains all the special features from that set. The first of these is a group commentary track that includes director Stuart Gordon, producer Bryan Yuzna and stars Jeffrey Comb and Barbara Crampton. It’s a high-energy track free of dull moments, with Gordon and Yuzna discussing a lot of production specifics while Combs and Crampton offer memories of the challenges of acting in such an FX-heavy production. Combs is a real live-wire here, frequently teasing Gordon over his choices as a director and sometimes cat-calling his own work. Also carried over from the MGM disc are a series of brief but eventful featurettes. An interview with Gordon runs just under nine minutes but packs in a variety of fascinating info about the film, including his thoughts on how cycles of horror filmmaking reflect what is happening in a society and how he was scolded by a member of the MPAA for his storytelling choices. A featurette entitled “Editing Room: Lost And Found” recounts the tale of how From Beyond was restored for its 2007 DVD reissue and the technical challenges of reinstating the lost footage. Finally, “Interview With The Composer” is a chat with composer Richard Band, who delivers a concise, fascinating analysis of his musical choices in just under five minutes. The MGM extras are rounded by an image gallery that includes stills, behind-the-scenes photos and promo art as well as a series of storyboard-to-film comparisons. The latter are done with care, presenting the storyboards in an animated form side by side alongside the respective scenes from the film. Gordon even offers a brief intro in which he stresses the importance of storyboards in doing an FX-heavy film. The Scream Factory edition of From Beyond fleshes out this already-decent package of extras by adding a new commentary and a quartet of new featurettes from Red Shirt Pictures. The commentary is a solo track featuring screenwriter Dennis Paoli: he needed a moderator to work with, as there are frequent gaps of silence and he often gets caught up in watching the film. However, fans will want to stick with it as he discusses the challenges of expanding on H.P. Lovecraft’s work to create a feature-length story (the actual Lovecraft tale is told entirely in the pre-credits sequence!) and explores the themes in the story that he found resonant. As for the featurettes, the shortest of the batch is “An Empire Production,” a chat with producer Charles Band that features him discussing the Italian studio he owned at the time and how he lures good craftsmen to work on his low-budget films. “Paging Dr. McMichaels” is a 14-minute chat with Barbara Crampton that has her discussing the challenges of her role, her thoughts on her cast and how she worked up the impressive display of histrionics she closes the film with. Jeffrey Combs gets his own featurette with “A Tortured Mind” and it finds him expanding on the thoughts he discusses on the group commentary track. It’s still worth watching because seeing him act out his anecdotes adds a new, satirical dimension to those stories. The last of the featurettes is called “Multiple Dimensions” and is devoted to the complex special effects of From Beyond. All four men who masterminded the illusions in this film – John Buechler, John Naulin, Anthony Doublin and Mark Shostrom – are interviewed for this piece. Each man discusses the particular effects he worked on, enthusing over the fun of adapting Lovecraft’s “unspeakable” horrors into visual form. There are also some in-the-trenches stories of production hardship, the most notable being Naulin’s tale of a potentially-crippling set mishap. Said anecdote might even be as scary (and darkly funny) as the film itself. One last extras note: this set also includes the brief but punchy trailer for the film, which packs an above-average amount of freakiness and excitement into one minute. All in all, the Scream Factory edition of From Beyond is an excellent upgrade for a deserving horror item. The transfer does well by a visually challenging film and the preponderance of extras, new and old, are all worth the time for fans. It’s well worth the investment for high-def-loving horror fans. 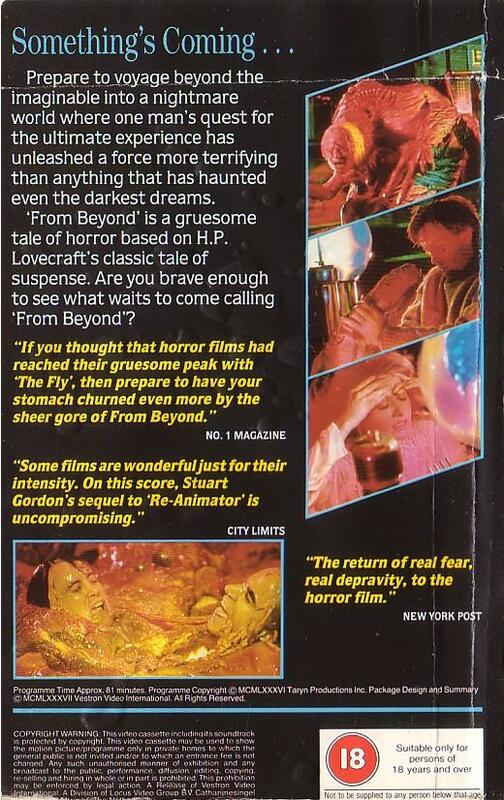 To read Schlockmania’s film review for From Beyond, click here.